Geoengineering approaches to reduce climate change unlikely to succeed | Watts Up With That? This paper also notes climate models incorrectly assume a given solar forcing has the same effect as a given greenhouse forcing. The paper finds solar forcing has ~31% more effect on the hydrologic cycle than greenhouse forcing, and thus this is another way climate models diminish the role of the Sun in climate. So Gaia does know if it is evil CO2 or some other source of warming. And evil CO2 has no complications from changes to the water cycle or anything else. The climate system is a black box of unknown or unquantified processes – except for the effects of evil CO2. Evil CO2 uses a different, simple process to warm the planet which has no conflict with other processes. Or what’s good for the goose is good for the gander. Didn’t the actual empirical evidence show that atmospheric moisture had declined during the recent warming spell? Or did I misread the satellite results? Wow. Not all forcings behave the same way? That ought to upset a few apple carts. Which original climate? The climate from 5 hundred years ago, the climate from 5 million years ago, or the climate from 4.5 billion years ago? Restated: Man’s realistic chances of changing Earth’s climate in any meaningful way are practically nil. Most of us are intuitively aware that ANY geoengineering attempt will be, at the least, ineffective, but more likely, catastrophic. We simply do not know enough about the climate and weather controlling mechanisms, although we often delude ourselves into thinking we do. The arrogance of someone believing we can do a better job of climate control than a planet that has been doing it for billions of years is just breathtaking. Somehow, that makes me less enthusiastic about the analysis. Geoengineering was never about controlling Earth’s climate. That was just the cover story silly rabbit. On small scales with very temporary affects can geoengineering be effective. The planet’s defense mechanism to keep itself in balance and the Sun’s influence will always confound the puny humans futile attempts at long term control. Besides, the money needed to make a dent is beyond the ability to pay for it. The real purpose of geoengineering research is to weaponize the weather, create temporary disruptions to scare and kill some people, and to poison and pollute the air, soil, and water with geoengineering chemicals for the benefit of the few. This paper includes exactly zero measurements of temperatures, humidity, water vapor, or any other actual physical feature involved in the hydrologic cycle of Earth. So, while they can say “The global hydrologic cycle is likely to increase in strength with global warming” — they have not even done a rough check to see if anything like that has actually happened anywhere. This is the first line of the abstract….maybe it has increased the “strength” of the hydrologic cycle….does anyone have any data? know of any data? Their hydrologic cycle has plent of clever equations, but no clouds. For the last few months in the midwest we’ve had some consistent inconsistent weather. A few days of high humidity, followed by a few days of dry weather. It was simple to observe just how temps moved over a 24hr period. The last couple of days are typical. Tue and Wed, humidity was 95%, temps barely budged up or down from 49f. Today and for the next few days, humidity down to 50%, and temps rising and falling 20f. About 25f for a high today, and forecast lows in the single digits. The speed at which the temps can drop is breathtaking. (click it, it’s safe and fast). that they propose to affect ? Here’s a good presentation you may not have seen. I still like steerable orbital mirrors for subtly altering the weather (well, once we have a method of actually predicting what the results, at any rate). Sigh. They keep mentioning evaporation but nothing about increased humidity creating clouds that would block sunlight, and thunderstorms that speed the transport of heat. Do they expect clouds and thunderstorms form only at night? They predicted the response of the water cycle for the two cases and found that, in the former, evaporation increases by 2% per degree of warming while in the latter this number reaches 3%. This prediction confirmed results of much more complex climate models. Model results confirm models. Yeah, right. Sure. Whatever makes them happy in La-La-Land. Therefore, reflecting sunlight by geoengineering is unlikely to restore the planet’s original climate. Define what the “original climate” should be. Also, define what the optimal climate should be. Is it a world without droughts, floods, heatwaves, cold waves, tropical cyclones, extratropical cyclones, tornadoes, hail, freezing rain, sleet, or any other bad weather event? “Original climate” sounds like Paradise to me; where is Adam and Eve in this new “original climate”? On the one hand, the human race has been accused to changing the Earth climate from unintended consequences of using its collective intellect. This paper on the other hand maintains the human race cannot change the forecasted climate even with a concerted, purposful, directed geoengineering effort. How would bioengineers measure the efficacy of their effort ? Stability of temperatures ? Stability of hurricanes ? “Normal” weather extremes ? Enquiring minds want to know. The thought that some fool persuades the world that his or her geo-engineering idea is worth doing fills me with a mixture of dread and contempt. Can you imagine the number of things that could and would go wrong, even in the unlikely event that the so-called problem was real. Aaargh! My thought exactly while reading. Was that one of the 2 models that even came close to the matching the ‘flatline’ or one of the other spaghetti lines in the IPCC graph? How does this stupendously stupid analogy hang on? Would that be the climate during the last glacial advance, the medieval warm period, the Roman Warm Period, the LIA, or 1936? What a good idea. Geoengineer for a cooler planet as we very possibly approach a mini-ice age. What type of climate are they trying to create?……for instance empirical data from the last six Holocene’s including our own have a variety of temps and climate changes. 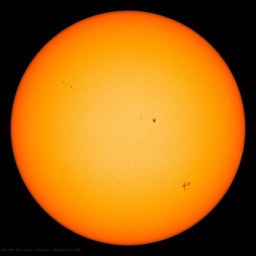 Do they want the one that was 5C warmer than today?…..or the Maunder Minimum? Or shall we keep the public guessing with the climate of around 12,000 years ago…when emerging from an Ice Age the temperature rose by 10C in thee years? Ego-engineering however is what a lot of climate-scientists on the warming side really prefer, and practise with great succes. But pride comes before fall. The current natural cooling will show their true colors. Right. Let’s put a “sunshade” over Canada/Siberia right now. We could reduce temps from -20F to -30F. It is fascinating to see how the climate hypesters turn, “It may rain more”- a good thing- into “heavy rainfall events may become more common”. It is similar to how every weather event reported is generally framed as a “storm”. Push that fear. “Answer: yes on warm cloudy summer days. No on cold clear winter nights”</b? Shouldn't that be the way around? IMHO,…their alphabet soup is missing a few letters. Is it time for all of us, rational people, to shift our attention from failed team of IPCC, Mann, Hansen, and Schmidt to the team of geoengineers? Unlike former, this team has real and large funding and significant academic and political influence. According to the IPCC they are already Geoengineering, they call it ‘solar radiation management’ and they are warning policymakers not to stop. @Steve Case: my experience of clear winter nights in Labrador was that there was no detectable CO2 warming (or much other kind of warming). On the other hand on muggy summer days here in Virginia the warming effect of CO2 is quite pronounced. Just anecdotal observation. Hmm…. this looks like an introduction to the Thermostat Hypothesis of Willis Eschenbach. They just didn’t follow through with……which leads to the formation of clouds as the opening act of the heat engine heat remover. It seems to me that there is too little emphasis on some of the fundamental problems with Kleidon & Renner. Kudos to ilearnedthatinhighschool for challenging the assumption of “original climate” and jorgekafkazar for hinting at the use of models. Sorry to others not specifically mentioned that elaborated on those, but I didn’t want to start a huge list. It should be fundamentally obvious that this paper uses “simple analysis” and “climate models” to “prove” something which is also the fundamental problem with much of the alarmist rhetoric. There can be no real proof of the assertions with simple analysis or climate models. Neither accounts for the real case of real changes that are experienced here on Earth. The only way they could validly prove that one forcing does one thing where a different forcing does another would be to take historical climate data from Earth and control it for other factors not related to the examined forcings (which we should all know is impossible, but they’re the ones claiming they have that level of knowledge to produce their models and make the predictions that they are) and show how each forcing historically changed the climate. That way, the only thing that could be disputed would be the accuracy of the historical data used and the methods of controlling for other factors. I acknowledge that even those elements of dispute yield considerable latitude, but Kleidon & Renner do not even go that far into research and instead just rely on over-simplified guesswork and fantastical models. If I make a program that counts from two to 200 by twos and then note the lack of odd numbers, I have not discovered anything! I have simply revealed my previous biases. While the analogy is crude, it is reasonably parallel. I think this is a case of embracing shoddy work because it supports previous bias. Please do not misunderstand. I agree with direction of this blog (which is really too diminutive a label for such a trove of information), but we should, in the interest of fairness and objectivity, be able to identify and indicate to others when a paper is more of the same meaningless hypothetical that is all too common in climate “science” these days even if that means debunking a paper that may buoy a sympathetic argument. Just as many have indicated in numerous other articles on this blog and in comments how so much of the body of climate research papers is nothing more than dressed-up conjecture, this research paper is likewise. Being that as the case, there is nothing to be gained from any conclusions made from false premises even if it supports our skepticism. I’m disappointed. I was hoping we could geoengineer by adding CO2 to thermally enrich the Earth and stave off the next ice age.